There’s no doubt that your wedding day will be the most special of days in which you will look and feel radiant. When planning a wedding, one of the bride’s main priorities is finding that perfect dress, but it is also essential to get the shoes right! Your shoes will contribute to your bridal look, and will also need to be chosen according to your personal style and, of course, comfort. 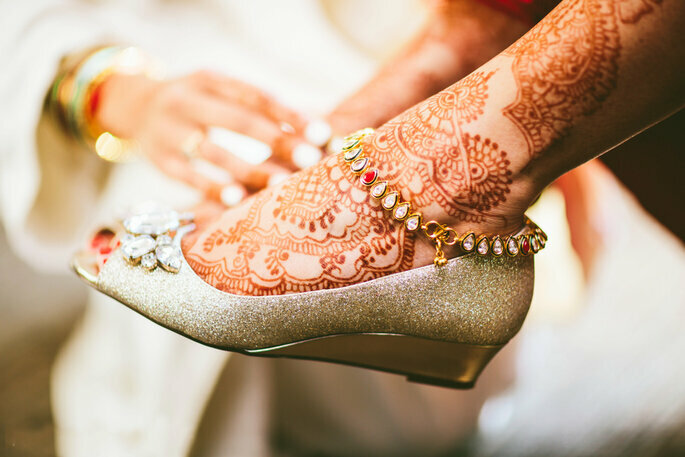 So, to help you in the all-important shoe-selecting process, here are 5 simple steps for choosing your bridal shoes. Gone are the days when brides only thought of wearing bridal stilettos. 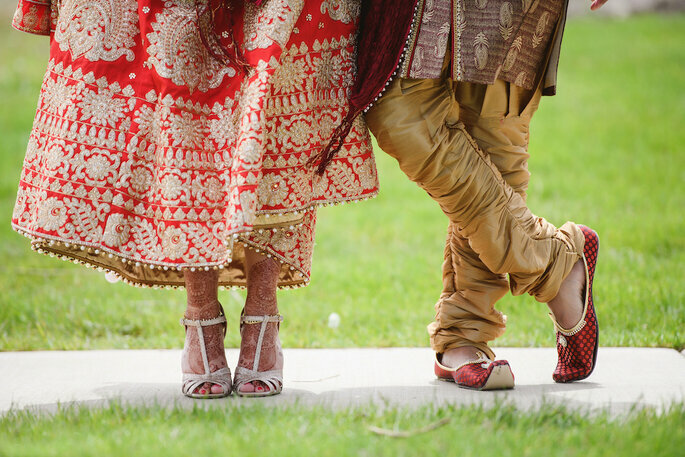 Nowadays, you can get away with any style of shoes for your wedding, in any colour. Whether they are flats, wedges, high heels, boots or sandals, the most important thing is that the shoe you choose fits your personality and makes you feel yourself. You should also consider the season in which you plan to marry. For a summer wedding you could choose dainty sandals, or if your wedding is Autumn-Winter, then velvet can be your perfect ally. Depending on your theme and personal style if your daring you could even rock out in boots! As with the time of year, you’ll also have to think about the terrain of your chosen wedding venue. If you’re jetting off somewhere for a destination wedding on a beach, for example, then flat shoes are advisable or wedged comfortable heels. If you’re getting married in a garden venue, then make sure you aren’t wearing stilettos that could sink into the grass. Or, a wedding in a ballroom or on a stone floor requires thick and sturdy heels. These precautions will ensure ultimate comfort and that there are no unnecessary trips or falls! The earlier you can plan your bridal look and choose your shoes, the better. Sorting your footwear early has the benefit of time – time to wear them in! 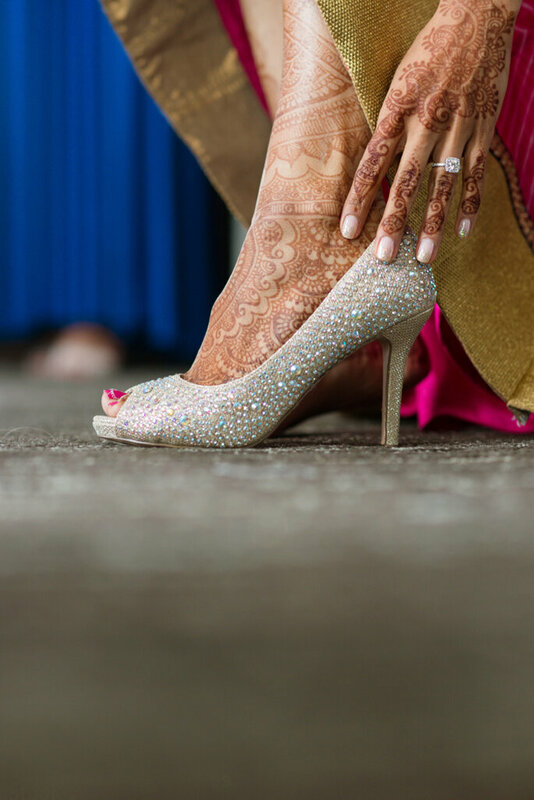 The last thing you want or need is blisters or discomfort on your big day, so make sure you strut your stuff in them at home a few times beforehand. 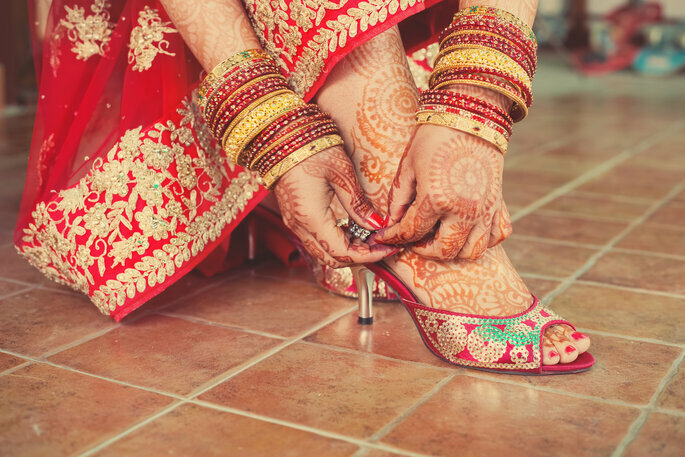 When it comes to preparing your bridal shoes, bare in mind that there may be a setback that you won’t be able to solve immediately on the special day. For example, you may need insoles or non-slip soles to correctly secure your foot and to prevent any kind of rubbing and always keep band-aids at hand, just in case. In bridal footwear, trends reinvent themselves season after season. These days, all brides seek to surprise their guests with a glimmer of a stylish shoe underneath their wedding outfit. Many women will be fixated on your bridal look, including the shoes, and so you should know which types to choose from. Colour: increasingly more women are opting for coloured shoes that give an original touch to their styling. Brightly coloured shoes fit with all styles, from the most romantic to the most boho themes. Peep-toes: with a good heel and platform they can be both glamorous and comfortable. There are infinite designs and colours of peep-toe shoes to choose from. Among the most used fabrics is satin, which gives off an elegant and sophisticated air with every step. Boots: a recent trend that can be found in lace or leather, and could be adorned in rhinestones or pearls for a unique wedding look. They are perfect for modern brides going for a more casual style. Wedges: these are especially suited for dancing the night away. Wedges are very comfortable footwear and ideal if your summer wedding will be celebrated on the coast. 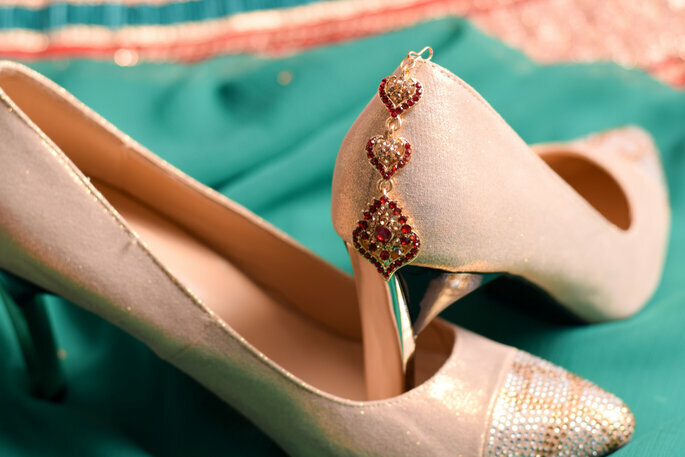 The most popular materials for bridal shoes range from leather, suede, satin and crepe, to lace, patent leather and added touches like glitter or embroidery. High: If you are a high-heel-wearing-pro that is used to strutting in such high heels at whatever the cost, then these are without a doubt perfect for making you feel just as confident on your wedding day. Mid: the medium heel is the most common, between 8 and 12 cm. This is the most popular among brides because it ensures both comfort and style. These heels are also great if you are a similar height to your partner and do not want to appear taller. Low/Kitten: between 5 and 8 cm, the kitten heel is a reviving trend and the most suitable or practical option for women who want to endure the whole wedding day without having to change footwear! They are also perfect for women who don’t often wear heels but want to pull out all the stops for their special moment. Flat: the flat shoe is also becoming more popular among current brides, since they are comfortable and there are thousands of shapes, colours and details that will make you look equally as elegant. Wedge: another comfortable shoe style that can be adapted to many styles and themes. There is such a variety of different shoe types and styles out there, that you just need to decide which is most suited to your wedding and narrow down your search from there. There are a few more pieces of advice to bare in mind. Remember that shoes add to your ensemble so you can match them perfectly using the same fabric or go contrast and make a bolder statement. Wear them in! seriously this is the best way to ensure you can dance the night away on your big day! If you are getting married in the daytime then opt for smooth, pastel tones that work with the natural lighting. When it comes to evening weddings, you can go all out with jazzy colours and glitter.